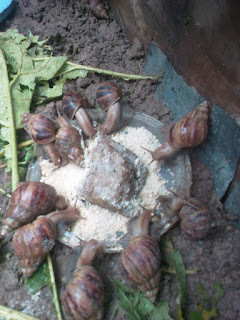 Snail feeding is very important and a major factor potential snail farmer should consider greatly. Feeding takes the largest percentage of the total cost of livestock production. This is one of the distinct features of Agriculture. It is imperative a farmer understands snail feeding habit and the type of food snails eat. Snails are wonderful animals, the effect of the food they eat is more pronounced in snails than other livestock animals. When you feed your snail with rich feed, you will get laudable yield. You may wonder why feeding is very important in snail farming; the size of your snail greatly depends on the quality and quantity of the food served. Even in the wild, snails scavenge for nutritious food. In this article, you will know the kind of food snails eat; various mode of feeding in snail farming and other crucial guides on achieving a great result through feeding. Read up! People often feel snail can eat anything or anything green. Yes! This is true to some extent but the question is; does everything human eats nourishes the body? Obviously No! This is because our body needs different types of feed at different times and developmental stage. Same applies to the feeding of snails. Snails are herbivores; they feed on greens. However, to enhance palatability and supplement nutrient, you can as well feed concentrate feed. Concentrate feeds are made from snail feed formula, which contains all the necessary nutrients and minerals required for snail growth and development. Fruits: Snails eat varieties of fruits. They feed on: pawpaw, mango, banana, eggplant, pear, oil palm, fig, tomato and cucumber, tomatoes. Tubers: Cocoyam, yam, sweet potato. Snails need carbohydrate for the supply of energy and protein for physiological growth and development. Vitamins and minerals are also very important, though needed in small quantity, they aid metabolism and also enhance growth. Also, snails require calcium for shell development. You can supplement calcium by sprinkling powered oyster shell or egg shell, ground limestone is also a rich source of calcium for snails. These are the natural foods snails eat. Amongst all the feeds, pawpaw leaves and fruit have been very outstanding. Several types of research have proven that pawpaw is an excellent snail food. Pawpaw leaves are rich in protein; it contains about 60% crude proteins, this will greatly help snail growth and development. Some farmers also give snail household waste. Well, this is dicey and I will not recommend such. This is because common salt is highly poisonous to snails and virtually all household waste contains salt. So avoid serving snail household wastes. Tubers are also good for snails as it is a major source of carbohydrate which supplies energy. I did not add cassava tuber even though snail does eat it; but only cassava tuber with low cyanide content. How do snails eat their feed? This is another aspect of snail farming that makes snail farmers curious. Most farmers serve their snails and expect the snails to eat them up immediately as other farm animals do. As a snail farmer, you must understand your snail feeding habit; snails are nocturnal animals, that is, they are very active during the night, early morning or rainy day. Snails eat at night and they can be very voracious if the food is appetizing and stimulating, thus, the appearance of the food has to be stimulating. Pawpaw is a good example of snail food that stimulates snails and makes them eat more. Your snail feeding method is also important; you feed snails by placing a flat tray in your snail pen and put the food; do not put the food on the soil, it can attract insects. At night, the snails will crawl to the tray and eat from it. You can go to the pen with a touch at night if you are interested in seeing how snail eats. Remove the tray and clean it daily to enhance the cleanliness in the pen. In addition, snails need water. Water is very important for all animals; serve your snail clean water daily in a shallow dish. For hatchlings and juveniles, serve water with water-soaked cotton wool because small snails may drown. When feeding your snails, you really need to be conscious of the quality of the food. Do not serve spoilt food as it may attract insects, the greatest enemy of snails. Clean the snail pen daily, evacuate the leftover feeds and serve fresh ones with a clean tray. The best time to feed snails is in the evening, it enhances the freshness of the food till night falls when the snails are activeor when the temperature is low or humid periods. Serve just once in a day as snails eat once in a day, at night or during rainy days. I recommend you download snail farming pdf for better understanding on snail keeping and management. Kindly share this article as widely as possible; if you’ve found it helpful, for others to benefit. Great insights into snail feeding habits. Many thanks for this. I just started snail farming and realise that my snails are normally very active in the first week, and then are generally slow and inactive for the rest of the time. They are not dead, but have burrowed and are in the soil all the time. Some are hatching but most are just slow and lazy. What could be the cause? Thanks a lot, l found this article very helpfull. Keep up ur good works. Please what is the formulation for the feed concentrate? Detail information on snail feeding. Thanks for these wealth of knowledge. Please how can I get these mineral supplements for my snails? Currently, we have over 100 snails but, they are not growing well, in fact, at all as expected. Please help!!! Thanks…. What do you feed them?